I have googled for short cut keyboards but couldn't found relevant result. Can you explain me the same please? Re: Shortcut for on screen keyboard in windows 7? 1. Press the 'windows' key + 'U'. okay. Read and follow other prompts as needed. automatically start the on screen keyboard. > Is there a set of keys that I can press to display the on-screen keyboard? > I know it's a bit ironic I ask this, but I need to find out. I thing now you are able ti get screen keyboard by this sortcut. In that Click on "Start On Screen Key Board". You can view the Black Coloured Key Board on your Screen. You can check it by Opening the Notepad and Clicking on the On Screen Key Board. If you want to Click "Ctrl +Z ".. you can first Click "Ctrl" and then Click "Z" which is not needed to press them simultaneously which we use normally. You can go for "Options" button which is at the right Corner of the On Screen Key Board. you can use on-screen keyboard instead of physical keyboard to enter data.this on-screen keyboard will be seen in the screen and you have to select the keys by using mouse.but for this,you have to download a on-screen keyboard shortcut. 1.first you have to download the on-screen_keyboard.zip file. 2.then click on the save button and save the .zip file to the desktop. 3.then you should open the .zip file and extract the on-screen keyboard shortcut. 4.then click on the on-screen keyboard shortcut,click on properties and general tab and on the unblock button. 5.then move the shortcut to where you want to use. there can be two ways you can make shortcut for onscreen keyboard (osk) ..either you create a short cut manually on desktop or you pin it to your task bar. step 1:go to START and in the search for program window type ease of access center and press enter. step 3: the on screen keyboard starts and in the taskbar right click on the OSK icon and click on 'pin this prgram to taskbar' and then onwards it gets pinned to task bar and you can use it with one click.see below image. step 3: in the dialog box appears type the shortcut name for the onscreen keyboard.it can be anything you want and then click on 'Finish' to create the shortcut. 2. Type the location below into the location area, and click on the Next button. 3. Type On-Screen Keyboard for the name, and click on the Finish button. 4. Move or pin the shortcut to where you like for easy use. Some times if key board does n't run on the desk top then we will use this on screen keyboard and also short cut for this is to go to control panel option and click on search icon then type on screen keyboard and then it will appear on the screen and it is only the way to get on screen key board.and you can use your system with out using keyboard with this option. click the close button on the on-screen keyboard when you are finished using it. the ease of access center provides a convenient,centralized place to locate accessibility settings and programs to make your computer easier to use.the ease of access center can be found in the control panel by selecting windows logo key+u and also when logging into windows. In the window 7 you can used the on screen keyboard in your pc then you have not need to used the physical computer ..
you can do it by the Ease of Access center . step 1: you can find the ease of access center in the control panel y selecting the window logo +u key. 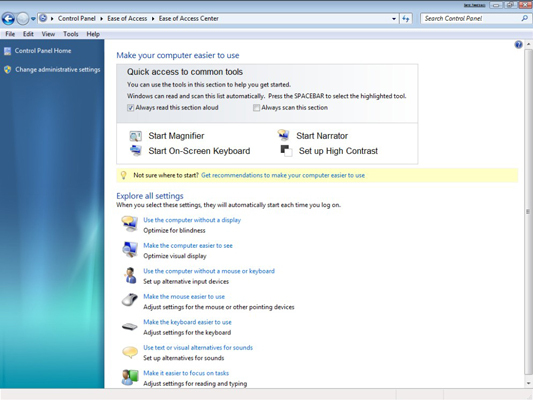 step 2: in the ease of access center window one oprtion is the on line keyboard so you can start by clicking this option. so by these steps you can open the on line keyboard and used to the enter the text . This will open the keyboard for you. start menu there is a searching space it provides. Type "on-Screen keyboard" . It will show the option click on it . Than it will open "Ease of access center" choose "start on-screen keyboard". If you want to use in shortcuts by it keyboard . you need to go right corner of the keyboard . There is a options gives you this type of facility. Some times if the key tables do the n it runs on the soul of desk then we will use this in keyboard screen and also take a short cut for this is to go to the option control board and it clicks in the icon of search then type in keyboard screen and then it will appear in the screen and it is only the interval to advance the screen types board.and can use your system with the exterior by using keyboard with this option.In the window 7 you can use the in screen the keyboard in your |pc| then has not needed to use the physical computer..
you can do it for the comfortableness of center of access. step 1: you can find the comfortableness of the access centers in the and of control board by choosing the |logo| of window +in form key of or. step 2: in the comfortableness of the access center the window a |oprtion| it is the keyboard on line so can begin for clicking on this option. begin menu exists a penetrating space that it provides. Type " in keyboard screen ". Will show the clicks of option add. That it opens " comfortableness of the access it centers chooses begins in keyboard screen ". If you want be accustomed in shortcuts for it keyboard. it needs to go the right corner of the keyboard. There is some options give you this type of the facility. ¤Right click on the Desktop. Select New and then click "Shortcut"
¤ Type the location in the location area where you want to create the file. Then click on the Next button. ¤Type the name On screen keyboard in the name area. ¤Click on the finish button. ¤Your shortcut is created. Now you can move the shortcut to the location of your choice. Easy to use. There is direct shortcut for On-Screen Board in Windows 7. However, you will have to press Windows Key + U. After pressing it, a dialog box will appear. You will have to choose On-Screen Keyboard from here. This is the easiest way to open On-Screen Keyboard quickly. Then Click On Screen Board. hello my friend...it is very simple to find on screen keyboard in windows 7. 1-Click on "Start" (Windows-Logo)	then, type "osk" in the search. 2-Then you can see the On-Screen Keyboard, just left click on it to open it. Now you are searching, how to create shortcuts for an screen keyboard in windows 7 and then you don't follow information bellow step by step and this is a very easy process and this is completed within 3 or 4 seconds only. After that you need to click on save button. You must save in the .zip file to the desktop. After that you need to open the downloaded .zip file and then right click on the onscreen keyboard shortcut, and click on properties, general tab, and here you need to click on the unblock button and if don't have the unblock button under the general tab, then the shortcut is already unblocked and after that move or pin the shortcut to where you like for easy use that's it. well yes it is very simple process just following these steps. 2.enter the text on keyboard. 3.now it will open . 3:That's it your on screen keyboard will appear after clicking that option! 3:That's it your on screen keyboard will appear after pressing enter! Choose Start→Control Panel→Ease of Access→Ease of Access Center. The Ease of Access Center appears and Windows 7’s ethereal voice kicks in, explaining how to change its programs. The Ease of Access Center contains a wide variety of ways to help users with physical limitations. If you’d rather not hear the Narrator, click the Always Read This Section Aloud checkbox to deselect the feature. Click the Start On-Screen Keyboard button. A keyboard appears, floating in the middle of your screen. If you’re having a hard time with the size of the keys, you can use your mouse to drag the keyboard larger or smaller to resize the keys.